r3.out.ascii - Converts a 3D raster map layer into a ASCII text file. Print grass6 compatible format. Flags -d and -r are ignored. 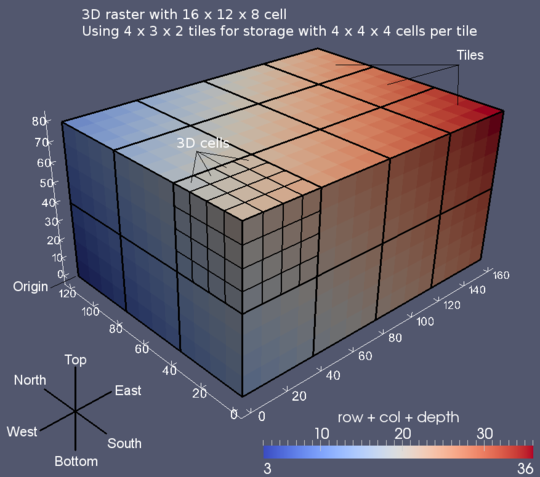 r3.out.ascii exports a 3D raster map in ASCII format. The input parameter is a valid 3D raster map in the current mapset search path. The output parameter is the name of an ASCII file which will be written in the current working directory. If output is not specified then standard output (stdout) is used. The -h flag may be used to suppress header information. The module is sensitive to region settings (set with g.region). The -c flag will create GRASS 6 r3.in.ascii compatible output. The default format of the exported ASCII file is equivalent to that required by r3.in.ascii. In particular, files output by r3.out.ascii with header information may be converted back to 3D raster maps with r3.in.ascii. order:   "nsbt" or "nstb" or "snbt" or "sntb"
This order is compatible with the r.in.ascii row -> column ordering. One level maps can be imported with r.in.ascii (2D raster) using the default nsbt order and removing the header lines "version", "order", "top", "bottom" and "levels". r3.mapcalc "simple_example = row() + col() + depth()"